Add carbon fiber cool to your trimming routine with this sleek design. Trimming your beard, sideburns, or any area with a comb and scissors may look very turn-of-the-century barbershop, but it's bound to be a tricky operation. 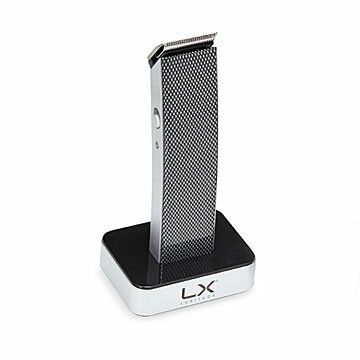 This trimmer and shaver set offers foolproof grooming with long-lasting, precision-steel blades and four clipper attachments to get just the right length. The carbon fiber body adds a touch of high-tech sleekness, while the charging stand keeps the cordless unit ready to tackle any hairy situation. Includes a zippered storage bag to take your grooming gear on the road. Made in China.